Wanna Shack up with Me???? Starting March 30th, we'll highlight a different design team member for you to scraplift. Go to their gallery, check it out, and pick a layout to scraplift. Post your version in the gallery, and do as many as you would like!! You'll have a week to get your scraplifts into our gallery. We'll all vote as a community for the 'best' scraplift by adding comments in the gallery and a vote to the famous Itty Bitty Judge. The design with the most comments/votes wins a Custom Designed layout by that design team member!! The more you play, the more chances you have to win. Cool, huh?? Won't you check it out? Over here...Itty Bitty Scrap Shack...we're waiting for you!! I was participating in a 4-week contest over at Scrap 4 Life. I didn't make it to the final round, but I did have loads of fun with the challenges and I made some layouts that I really like! This first one was a Bling challenge. I used glimmer mist on the big letters, stickles on the smaller letters, stickles to outline the butterflies in the patterned paper, and some really cool Heidi Swapp glitter tipped flowers. I love this paper from Close To My Heart. The next challenge was to use a transparency. I took a plain one and stamped with a toilet paper roll with red acrylic paint. The paint was thin, and bubbled up. When I popped it, it splattered but I think I like the look! I used some older S.E.I. paper that I just picked up for a great price at the local scrap expo. This last one was to make your own embellishment. I cut out ovals with my cricut and layered them to make a butterfly, adding some primas and bling. I also handmade the buttons up top. Used clear epoxy circles, placed them on patterned paper, cut the circles out and punched button holes with my Cropodile. Love this paper from My Mind's Eye. Although...it's tough to find a patterned paper I don't love! LOL!! Now i'm working on my April kit from Itty Bitty Scrap Shack. It's full of Fancy Pants goodness and it's alot of fun to work with! My youngest brother Paul lives on the East Coast. He just moved there last summer. We get to see him on major national holidays and usually keep in contact via email and family gossip. He has been on the West Coast for a couple of weeks and was in the area. So, he came by to visit. The visit was disguised as a furniture pickup for my mom. The kids were excited to see Uncle Paul!! They made him birthday cards (Kevin's was this elaborate identify-the-drawn-creature game + card. It was very detailed). The kids completely monopolized his time. I seriously got in about 5 minutes of talking, the rest was spent by the kids showing him the garden, their rooms, their Hello Kitty water cooler, making Paul read them books and eating expertly designed fruit animal snacks. When he was leaving, I whipped out the camera on the front lawn and got these priceless photos. We loved seeing you Uncle Paul!!! And seriously, what's up with the beard??? How long is that going to stick around? I bought a new set of Cupcake stamps yesterday and just love them! They are by Inkadinkado and are too cute. I had to break them out tonight and make some cards. I used the March Home Grown kit from Itty Bitty Scrap Shack for all these cuties. I am liking the cards lately. Great for nights where I want to be creative but just don't have the time or energy for a full layout endeavour. Thanks for looking! I can't wait for tomorrow...the First Day Of Spring. The weather here is already spring like...and I like it! Wow, today was opening day for baseball season. It always feels like spring when baseball starts. My son is playing coach pitch (where the coach pitches to the kids) and is doing so great! It's amazing to see the improvement in all the boys from t-ball to this year. Some of those boys can really hit the ball!! Kevin got 4 hits today and made some 'plays' in the infield. Still working on the 'throwing the ball to the correct spot', but he'll only get better. It was HOT HOT HOT at the field today, felt like summer. It was so nice. I had a grand ol' time playing with my new camera and zoom lens. Wow, the ability to get closeup just makes me so happy!! It was amazing how stepping into the Little League fields instantly brought me back to my childhood. I was a competitive swimmer my whole life, I think. From the time I was about 7, we spent almost every weekend at a swim meet. The smell that brought me back was the snack bar at the field. The grill was going and they were grilling up hamburgers and hot dogs and other various meat products. But it smelled just like it did 30 years ago. Pretty amazing the way a smell can trigger some powerful memories. It was actually pretty cool. Thanks for stopping by! It was gorgeous here today...I think spring is NEAR! Seriously, obsession is not a strong enough word!! My kids LOVE The Backyardigans. They love the TV episodes, the mini-movies, the music. We just got a new music CD and they cannot stop listening to it. We danced all over the house tonight. After about 4 or 5 songs...I am done. But they can just go on and on and on and on...If I could just bottle their energy! I do like the episodes, each one is based on a different style of music so that's pretty cool. We just saw one that was rock opera-like, reminded me alot of Queen. And one episode called Blazing Paddles, which is a funny knock-off of Blazing Saddles. Clever!! And the songs are TOOOOOO damn catchy, I sing them all day at work! Thanks to Ari and Shawn at The Scrapping Spot for the sketch that inspired the layout. I want to share some projects I created using the Home Grown kit from Itty Bitty. The papers are from October Afternoon and were so beautiful. Love the rich colors!! I had not used this paper before and I am so glad I got the chance!! I've been having a great time creating lately. Thanks for stopping by! So, there's been some discussion over at The Scrapping Spot why ovals are NOT cool like circles seem to be right now. I decided to try to make something cool with ovals. So I pulled out a bunch of older My Mind's Eye paper and cut a bunch of ovals out with my Cricut. They morphed themselves into this butterfly. I like it! I like it! AND I used my new scalloped circle punches that I just received. I've been trying to find these forever and finally just bought them from Joann's online. I hate paying shipping, but it was worth it!! AND I just got my April Kit from Itty Bitty. It's delicious!! Fancy Pants papers, custom made buttons and a beautiful doodled transparency sheet made by our very own Bethany!! I can't wait to play! Wow, it is WINDY here today!! I hate the wind. It's awful, makes my allergies go crazy and keeps us in the house. No fun being outside when it's windy. No fun at all. So we created a bit of fun inside. The kids got kid cookbooks for Christmas and picked a recipe to bake this morning. Of course, they picked cookies. 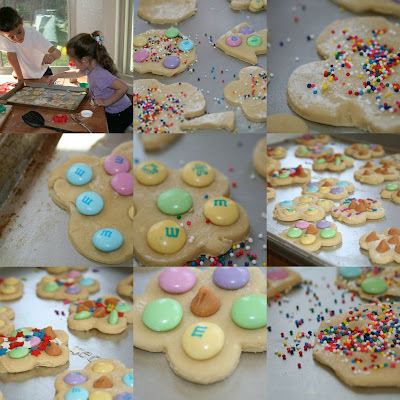 We made sugar cookies with a spring feeling (flowers, butterflies, 4-leaf clovers) and decorated with M&M's, sprinkles and butterscotch chips. Yummmmm-O!!! Always wanted to figure out these photo collages and finally did. Wow, so productive for a Sunday! !